Home » Event » Lucille Clifton Reading Series » Rita Dove and Joshua Coyne Bring History to Life with Poetry and Music. Rita Dove and Joshua Coyne Bring History to Life with Poetry and Music. HoCoPoLitSo has a history of pulling together people, words and music. A forty-year history, in fact. A world graph of some of the response to the Sonata Mulattica event. For the first time, prodigy violinist Joshua Coyne and former U.S. Poet Laureate Rita Dove shared the stage to perform works inspired by an almost-forgotten eighteenth-century Afro-Polish musician — George Augustus Polgreen Bridgetower. Dove read poems from her biographical book of poems about Bridgetower, Sonata Mulattica, and Coyne played his own composition, “Fingers,” a plaintive work meant to embody Bridgetower’s doomed career. The program was filmed by a crew from Spark Media for a documentary of the same name as Dove’s 2009 book, and a selection of scenes from the documentary premiered at the HoCoPoLitSo event. Dove, whose book was described by the New Yorker as “a virtuosic treatment of a virtuoso’s life,” explained Bridgetower’s story at the reading. First, a musical tot is discovered in the servant’s quarters and given a tiny violin, an overbearing African “prince” as a father showcases his son’s prodigious talents, the boy’s talent blossoms under Haydn’s tutelage and the patronage of the Prince of Wales. Then, as a youth, Bridgetower meets Beethoven. Beethoven and Bridgetower collaborate on an intricate sonata, which the going-deaf composer dedicates to his “crazy mulatto,” according to historical letters. Then the story turns even more soap opera: the handsome young Bridgetower either insults or flirts with or steals (according to one’s perspective) a young woman that Beethoven has been coveting. The elder musician rages, tears up the dedication page, and Bridgetower retreats from Vienna in shame. His career skids to a halt a scant decade or so after it began. He dies in the London slums seventy years after he played in Paris to great acclaim. HoCoPoLitSo’s Tara Hart in conversation with Rita Dove and Joshua Coyne. 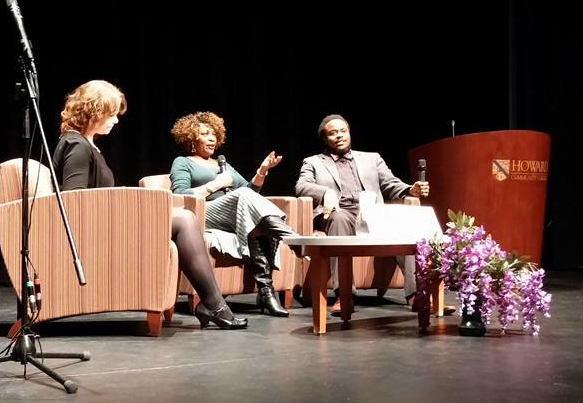 After Coyne’s two original songs were performed, one based on Langston Hughes’ poem “A Dream Deferred” and sung by Emmett Gabriel Tross, and the second played by Coyne on the violin, Dove and Coyne sat down for a discussion with the audience, moderated by HoCoPoLitSo board co-chair Tara Hart. The two artists talked about when they first met and how they threw back and forth improvisations on free verse and piano music. And Dove explained that she formerly played cello. Coyne talked about playing the Bridgetower sonata, about it being a dialogue between the piano and the violin, and how “it is a killer,” he laughed. And they offered advice to artists everywhere, on which work was the hardest they have composed (both agreed, they were all the hardest), and to learn to relax about creating. Outside, after the cheese and fruit were picked clean, and the red-clad volunteers from Columbia’s Delta Sigma Theta alumnae chapter had gone home, Dove lingered for photos and signatures on her books. 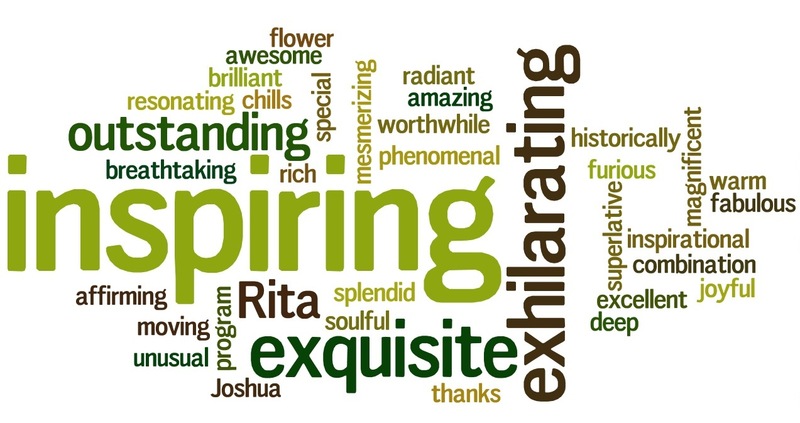 Across the glossy foyer, sticky notes papered a column with thoughts about the evening written by audience members: “DEEP,” “inspiring,” “awesome,” they read. This performance was presented free to audience members to commemorate the first reading HoCoPoLitSo offered, in November, 1974, by the late poets Lucille Clifton and Carolyn Kizer. HoCoPoLitSo is grateful to partners and donors that made the evening possible — the Alpha Phi Alpha Foundation, Candlelight Concert Society, the Columbia Film Society, the Howard Community College Music Department and the Columbia (Md.) Alumnae Chapter of the Delta Sigma Theta Sorority. To help HoCoPoLitSo continue pull together programs of this variety and quality, and make them available to all in the community, please consider making a donation. By hocopolitso in Lucille Clifton Reading Series on November 3, 2014 .